Q: The Weibo account of the US Embassy in China made comments today that it objected to the letter of the China Civil Aviation Administration which asked foreign air carriers to change their identification of the Hong Kong, Macao and Taiwan regions, compelling private firms to use specific language of political nature. What's your reaction to this? A: I already responded to this issue yesterday. I can restate my answer if you need it. Follow-up: Can you make a response to the comments by the US Embassy? A: Whatever the US side says or does will never change the objective fact that there is only one China in the world and the Hong Kong, Macao and Taiwan regions are all inalienable parts of China's territory. 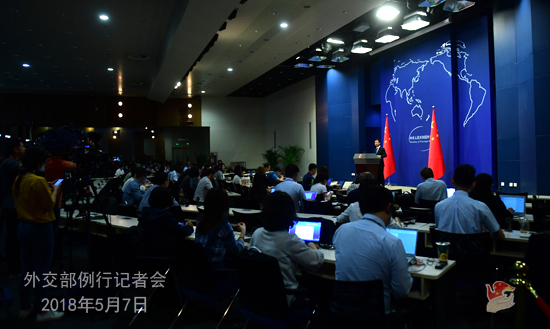 China will continue to handle its relations with other countries in accordance with the one-China principle. In the meantime, we have to point out that foreign enterprises operating in China should respect China's sovereignty and territorial integrity, abide by China's law and respect the national feeling of the Chinese people. This is the basic principle for them to follow when doing business here. Q: According to reports, the DPRK Foreign Ministry spokesperson said that the US recently alleged that the DPRK's intention to denuclearize, unveiled at the Panmunjom Declaration, was the result of sanctions and pressure and that it would not ease sanctions on the DPRK until complete denuclearization is achieved. When the situation on the Korean Peninsula is moving towards peace and conciliation, this act of deliberately provoking is a dangerous attempt that will dampen the hard-won atmosphere for dialogue and bring the situation back to square one. What is China's comment? A: With the concerted efforts of all relevant parties, the Korean Peninsula has witnessed a series of positive changes and the situation is moving towards amelioration. This hard-won situation needs to be cherished and preserved all the more by all parties. Under the current circumstances, all relevant parties more than ever need to stay the course, work for the shared goal and speak and act in a way that is conducive to demonstrating goodwill, easing tensions, promoting dialogue and enhancing mutual trust. We hope that the DPRK-US summit now being scheduled will proceed successfully and achieve positive outcomes, and that the current positive momentum on the Peninsula will be consolidated and strengthened. 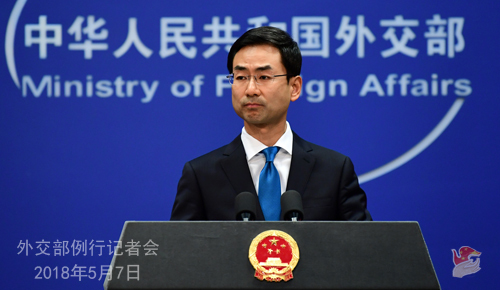 China calls on all parties to follow the dual-track approach, advance the political settlement process of the Peninsula issue, address all relevant parties' legitimate concerns in a balanced manner and jointly open up a future of lasting peace and stability for the Korean Peninsula. Q: According to reports, the registration for the 71st World Health Assembly (WHA) will end today, and Taiwan has yet to receive an invitation. The WHA invited Taiwan for eight consecutive years from 2009 to 2016. What is your comment on it? A: The one-China principle represents the universal consensus shared by the international community. The WHA must adhere to the one-China principle which has been endorsed by the UN General Assembly Resolution 2758 and the WHA Resolution 25.1 when handling the Taiwan-related issues. The Taiwan region attended the WHA in the name of "Chinese Taipei" as an observer for eight consecutive years from 2009 to 2016. This was a special arrangement made by cross-Strait consultations based on mutual adherence to the 1992 Consensus which embodies the one-China principle. The Democratic Progressive Party (DPP)'s refusal to acknowledge the 1992 Consensus embodying the one-China principle undermines the political foundation for the Taiwan region to attend the WHA. If Taiwan does not receive the invitation this year, the DPP is the one to blame. Q: According to reports, on May 7, the presidential inauguration ceremony will be held in Russia, which will formally usher in the fourth term of Vladimir Putin. What is your comment on the swearing-in of President Putin? How do you look at the prospect of China-Russia relations? A: The presidential inauguration ceremony will be held in Russia in two hours. We extend our heartfelt congratulations on President Putin's inauguration. President Xi Jinping has already sent a message of congratulation to President Putin for his reelection. We believe that under the leadership of President Putin, Russia will score new achievements in its national development and socioeconomic progress. Under the strategic guidance and personal care of President Xi Jinping and President Putin, China-Russia relations have been growing at a high level. The China-Russia Comprehensive Strategic Partnership of Coordination is now at its historical best with close exchanges at all levels, smooth progress in cooperation across the board and ever stronger political mutual trust. Our two sides exchange views on major international and regional issues in a timely manner and maintain close coordination within multilateral mechanisms, thus making important contributions to upholding world peace and stability. Presently, both China and Russia are at a crucial stage of their respective national development. We are convinced that under the guidance of the two heads of state, the China-Russia Comprehensive Strategic Partnership of Coordination in a new era will become more and more substantive and the path of our cooperation in various areas will get wider and wider. Q: Kyodo News reported that Japanese Prime Minister Shinzo Abe and Chinese Premier Li Keqiang will agree on the maritime and air liaison mechanism aimed at preventing unintended clashes. Can you comment on it? A: China and Japan share the same goal on the crisis management in the East China Sea. 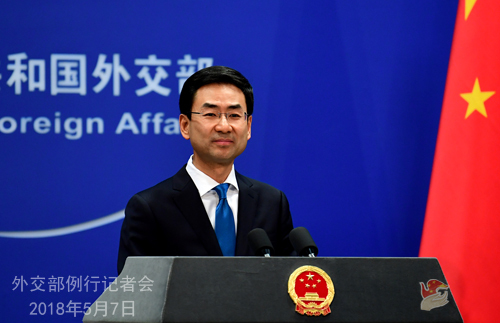 Establishing the China-Japan maritime and air liaison mechanism will help our two sides step up mutual trust, manage differences and uphold the peace and stability of the East China Sea. Now the competent departments of our two countries are accelerating the relevant preparation for the launch of this mechanism.